RAWALPINDI: Chief Justice Mian Saqib Nisar expressed anger on the statement of Justice Shaukat Aziz Siddiqui in which he alleged that an agency was interfering in the superior judiciary’s matters. 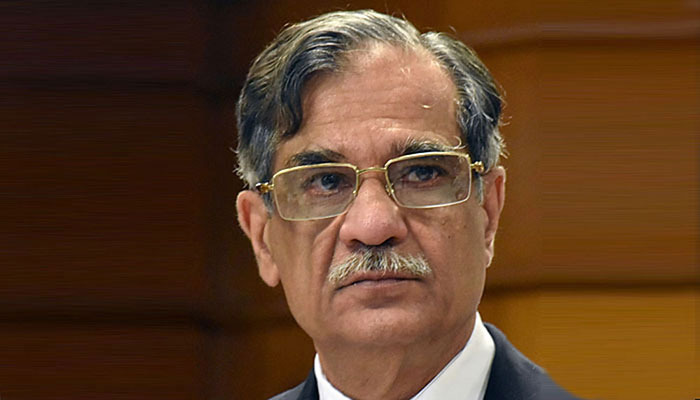 During hearing at the Karachi Registry on Sunday, the CJP remarked that the judiciary is working freely. “I felt saddened to read the statement of an Islamabad judge. As the head of judiciary, I assure you that we are not under any sort of pressure,” the CJP observed. Justice Shaukat of the Islamabad High Court, who is facing a reference of misuse of authority against him in the Supreme Judicial Council, threw barbs at the agency for its alleged interference but he gave no evidence in support of his allegation. "I was told that if I pass judgments on ‘their’ directives, then the references against me will be withdrawn," he said, while addressing at the Rawalpindi District Bar Association (RDBA) officer here. "I was also assured that I will be made chief justice of Pakistan in September and not even November. But I don’t care about my job, as you do not become a judge through your post but through just ways," Justice Siddiqui upheld. He said the judiciary was 50 per cent responsible for the country’s current situation while the institutions were responsible for the rest. "For a while now I have been wanting to present myself before the bar for accountability. I wanted to do that because only my bar can hold me accountable and there have been no corruption charges against me to date." "Whenever I pass a judgment in a crucial case, a group starts a campaign, claiming that there are corruption references ongoing against me," he added. "However, I am clean and thus requested the Supreme Judicial Council (SJC) to conduct my open trial and invite lawyers to see if there is any truth in the corruption allegations. If any corruption charges are proven then I will resign," Justice Siddiqui continued. He also urged lawyers to become a source of decreasing crime. He further lamented, "Today, even the independent media has cowed down." Agencies add: Justice Siddiqui claimed that this agency had also approached the IHC chief justice for constitution of choice benches. He claimed that the IHC Chief Justice Anwar Khan Kasi had been conveyed that they did not want Shaukat Aziz Siddiqui on a particular bench. The IHC judge said that the law students are still not aware of Justice Munir’s role which is revealed every now and then. He said the judicial freedom had been compromised and now it was in someone else’s hands.